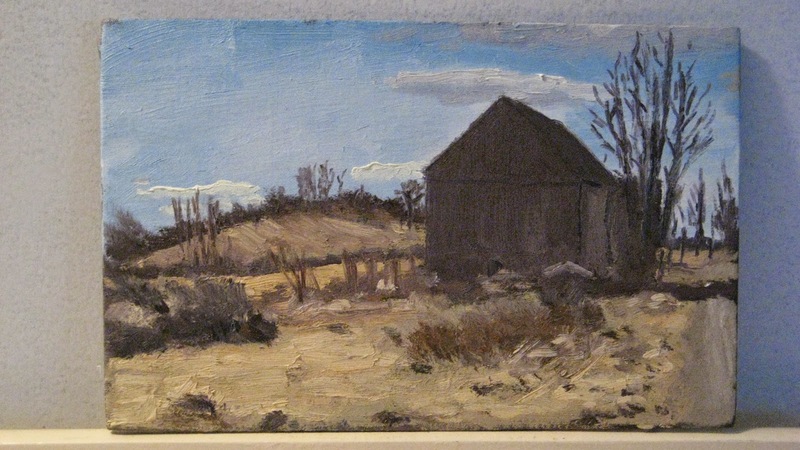 Matt Chinian Painting Blog: Wait's Hill Rd. with piglets! It was a ridiculously warm day for this time of year, and although the morning was overcast the cloud cover was thin and there was a lot of light, then the sun made appearance (or two). These are my panels with the marble dust/rabbit skin glue gesso, the tone is thinned out burnt umber, it behaved differently than my previous panels, but not too much. There is sun on it, and shadow. Because the scene was generally on the light side and didn't have much dark, I started with the light. When looking at the sky and the road, they were not as different as you might imagine, so they were related on the pallet as well. This painting had a lot of grays! The tone was cooler that the orange/red tone I used in the summer, but it still read as warm over all the cool light gray's of this scene. There were a lot of subtle green as well as the yellow/orange of the foliage, I think the saturation of the yellow was the strongest in the painting, and that brings it out. Much of my darkest color were trees and other stuff that I wanted to do last, it's not the pure way to do it, but by the time I was ready to add those things, the painting popped. Here is where I ended up! Here is my scene, I've been here before, and down the road too. I keep thinking "I'll paint in the village", and somehow end up not in the village! This was from February, 2013, almost 2 years ago. I like how you succeeded in painting the shadows on the road. Although this painting has a lot of grey tones, it is not boring! Well done. And those piglets are so sweet! Thanks Chani, shadows like so many other things are dependent on their tones/values and the tones/values of the road in sun, their drawn shapes are important too, but not as much as you'd think. The sow and her piglets didn't come out until the farmer came by to feed them, I'm not sure if I've seen such young (3 day old) piglets, but you just can't get any cuter!